This morning, it struck me that an introductory page on the topic of Greek Paleography might be useful for a variety of reasons, but particularly for those wanting to look at this newly re-discovered manuscript of Origen’s. While the manuscript is easily one of the clearest and easiest to read miniscules I’ve seen, it still contains plenty of features that will cause trouble for those who haven’t read Greek manuscripts before. This post will explain several of these "perplexities." My goal is that other interested, intermediate-level Greek students like me would be able to read this particular manuscript, even if they have little or no paleographical experience. For those wanting to go deeper, I can scarcely do better than recommend the resources which Fordham University hosts. Their resources also have beginning paleographers in mind, and they have several extremely helpful charts. There is also a helpful bibliography. The difficulties lie in several places: first, there is the matter of word-divisions. Additionally, there are several unfamiliar letter forms. Finally, one must also contend with abbreviations (like the nomina sacra for instance) and ligatures (combinations of multiple letters into a compound character). I’ll discuss each, and give examples from the manuscript. Finally , I’ll post a paragraph or so on which to practice. Most Greek words contain one and only one accent, where an accent is acute (ά), grave (ὰ), or circumflex (ῶ). Breathing marks (ὁ or ὀ) only occur over initial vowels (and ρ). These rules, along with a general knowledge of Greek, help me divide up the first line with relative ease. Ποταπὰ ἆρα τὰ ὕδατα ταῦτα. Thus, if you’re not sure how the words should divide, identify the accents and let them guide you. If you see a grave (ὰ), that has to be our last syllable of a word. If you see a breathing mark, then you’re dealing with the initial letter of a word. The other, more complicated rules of accentuation are helpful too; but even these three will help you quite a bit. The Greek script has evolved quite a bit in almost 3000 years. In our case, we’re dealing with 8-900 years since this manuscript was written. The Fordham site contains some extremely helpful charts which give several ways for each letter to be written (make sure you’re looking at the miniscule portion). Some of these variant forms are just different. Some, look remarkably like other letters. Here’s a few that might be tricky. That said, sometimes it’s hard to tell the difference, and you have to judge based on knowledge of Greek vocabulary. I tried for far too long to find a word κλέπει (doesn’t exist), before I realized the κ was a β.
Zeta extends below the line, and can start from there. It sort of resembles a 3. But it also has a different form that’s a bit harder to spot. θεὸν– God. (curiously not written in the abbreviated nomen sacrum form). Notice that the μ connects to the ε, while the ν does not connect to the ο.
θεὸν– God, in the accusative form. We’re at the end of a line, so the last syllable, ων, gets dropped, and replaced by a line above the word. Writing a line like that above the word is a common way to abbreviate ων. Again, we’re at the end of a line, so the ον get replaced by two "backslashes" above the τ. This is a common Byzantine practice, but it doesn’t show up too often here. Some scribes will almost always write τὸν that way. Ligatures are often difficult. The occur two or three independent letters are combined into one glyph. Some easily decompose into their constituent parts, but others you just have to learn. The Fordham page has several charts that contain ligatures, but it’s far from exhaustive. Here I’ll list the ones I’ve come across so far. The are in alphabetical order (by the first letter). ει. This one is pretty common. 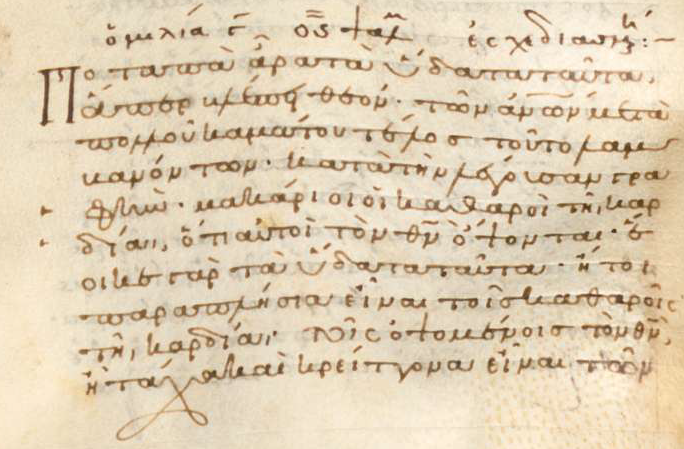 ου- not common in this ms, but common elsewhere. υς- This one is a bit tricky because it looks like the dative form: τοῖς τόποις. However, what looks like an ι is really an υ smashed into the σ. The accent above the article also gives it away: τοὺς τόπους. ωρ- Sometimes letters are just superimposed! ως- a lunar sigma written inside an ω: creative! You can find my transcription here. If you find any errors here, (typos, incorrect information, etc.) please let me know in the comments. Suggestions and questions are welcome too. Τοὺς τοποὺς in your text should read τοὺς τόπους. Thanks for the correction! I’ve updated the page. I will translate this article to Portuguese dialect! With appropriate references, of course. Wonderful! I’m glad you’ve found it helpful.